A key area of concern within the IMPACT (Improving Medicare Post-Acute Transformation) act is that of preventing pain and alleviating suffering occurring in older adults in skilled nursing facilities. The Nursing Home Quality Improvement Campaign provides ongoing reporting on state and national rates of Quality Measures, including the rate for residents self-reporting moderate to severe pain. This information is shown in the graph below. 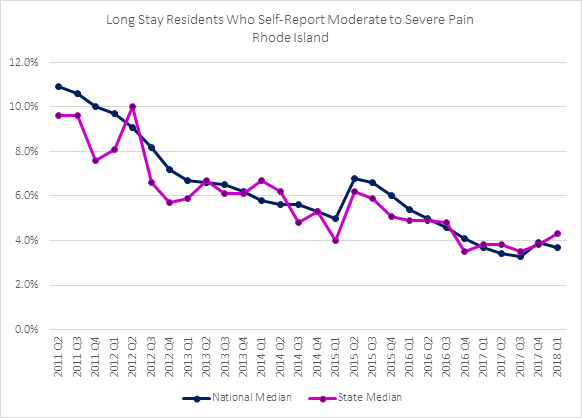 This sample provides a means for comparison of a facility’s performance in the pain metric with the state average of 4.3% (Rhode Island in this example) and with the national average of 3.7%. Both averages show a gradual decline in the percentage of long stay residents reporting moderate to severe levels of pain. The results are reflective of work to reduce pain experienced by nursing home residents. Given the emphasis on avoiding or minimizing the use of Opioid analgesics, the trend demonstrates the effective use of alternative, non-opioid medications and adjuvant therapies for pain management. Facilities working to reduce the percentage of residents reporting moderate to severe level of pain might consider the following strategies, starting with development and implementation of a policy for management and assessment of pain which includes an expectation that pain scores of 5 or higher result in action. Strategy #1: Pain is everyone’s business. As such, it should not be considered information only for the nurse. The Nursing Assistant or any helpful staff member can assist with offering a pillow, dimming the lights, offering a glass of water and then notifying the nurse of the need for a medication. Strategy #2: Pain is a partnership with the patient. What level of pain is tolerable for the patient? [Facility Name] has established a standard that a score of 5 or higher results in action, including a call to the provider if the medication is not effective. Strategy #3: Pain medications work better when nonpharmacological strategies are used. The use of a calm and quiet environment can promote the effectiveness of medications. Dimming room lights, reducing noise levels can help promote comfort and give the medication time to work more effectively. Strategy #4: Pain management strategies work best when the patient doesn’t have to ask for them. Scheduling analgesic medications around the clock (while awake) is a best practice. Anticipating pain through hourly rounding, offering repositioning, hydration and toileting will go far in promoting comfort. Strategy #5: Pain strategies work better when we are all using the same playbook. Consistent messaging is essential. Some patients are expected to encounter pain with activity, yet the avoidance of activity will result in loss of function. Medicating prior to Therapy and assuring that the patient understands that reducing activity will result in loss of function, which is not a good outcome, are key strategies. It is critical that the patient understand that sometimes Therapy will be uncomfortable, and that the team will work hard to make sure that the patient is as comfortable as possible, while still making gains in Therapy. Care Plans for pain should include individualized perspectives for the patient on their expectations for pain management, including incorporation of the above strategies. Interventions for pain management should include the full team with creative and non-pharmacological methods included in the discussion. Harmony Healthcare International (HHI) is available to assist with any questions or concerns that you may have. You can contact us by clicking here. Looking to train your staff? Join us in person at one of our our upcoming Competency/Certification Courses. Click here to see the dates and locations.